Nili was called to the Bar in 2017 and has a broad civil and public law practice. She has broad general litigation experience from the private and public sectors, and has also worked internationally at the International Criminal Tribunal in The Hague, the Netherlands. 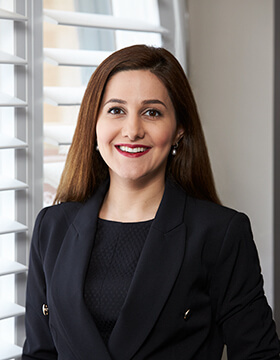 Nili has extensive experience representing plaintiffs and defendants in personal injury matters including CTP, public liability and medical negligence claims. Nili’s experience in personal injury ranges from soft tissue injuries to catastrophic claims, and also historical and institutional abuse claims following the Royal Commission. Nili also practices in wills and estates, family provision claims and probate matters in the Supreme Court of NSW. Immediately prior to being called to the Bar, Nili was the litigation Manager of the Coronial Inquests and Hague Convention team at the NSW Government Department of Family and Community Services. Nili has particular expertise in conducting coronial inquests, and has given seminars on coronial law at the UNSW CLE programs. Nili holds a Bachelor of Law with Honours and a Bachelor of Commerce from Macquarie University. She obtained a Masters of Law in 2017. Nili is an Adjunct Lecturer teaching Advocacy, Ethics and Civil Litigation at the NSW College of Law.